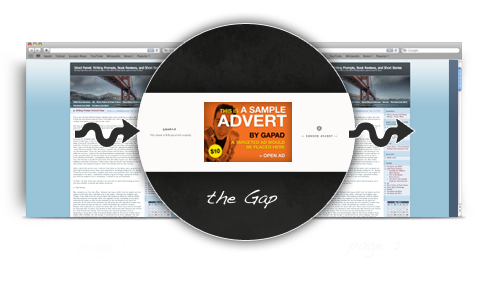 With GapAds between pages, you can set ads to appear when users move between various pages of your site. You can control how often your ads are shown and on which pages. You can also set a trigger delay on when the ads appear. Our technology automatically places ad triggers on the pages you want to ads to show. When you sign up to Gapad, you are given a management dashboard area where you can control which of your exit link ads are triggered and view statistics on how they have performed. You’ll also see how much money the ads have accumulated on an ongoing basis.